We discovered Cupcake Caps from their Flickr account and think they're awesome (and they just got started last fall). What I really like about them (this is on sight, I haven't tasted them yet) is that someone saw a need in cupcake land and filled it. That's why I like to ask the "Is there any innovation you'd like to see made to the cupcake that would improve it for you?" question in our cupcake interviews. the single mom of elementary age twins. and arrive late afternoon still looking fabulous. 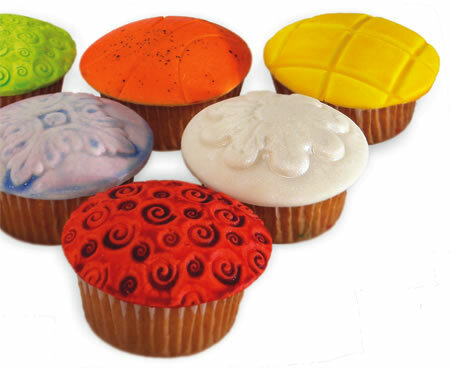 Unwrap the Cupcake Cap and gently place it, inside curve up, in the palm of your clean, dry hand. With your other clean hand, pick up your frosted cupcake and gently "screw" or wiggle the cap onto the top of the cupcake. Don't FORCE or PUSH or JAM the Cupcake Cap on. It will break or buckle (remember - these are edible). 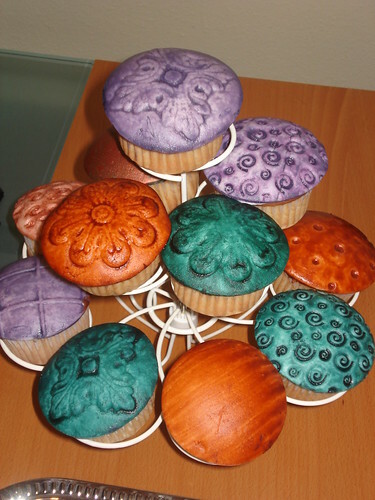 What is the texture of a Cupcake Cap like? Hmmm. Well... they are firm but very biteable. 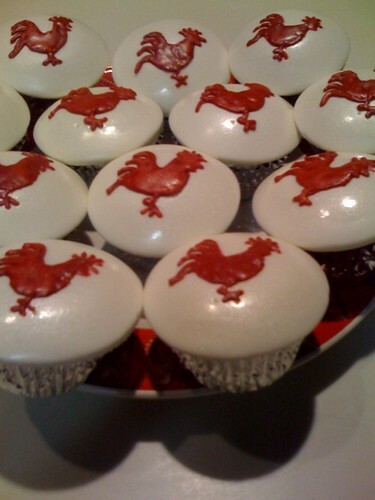 As sturdy as Cupcake Caps are, everyone finds them surprisingly tender to bite into. And NO! They are NOT made of fondant. They're MUCH better than that! 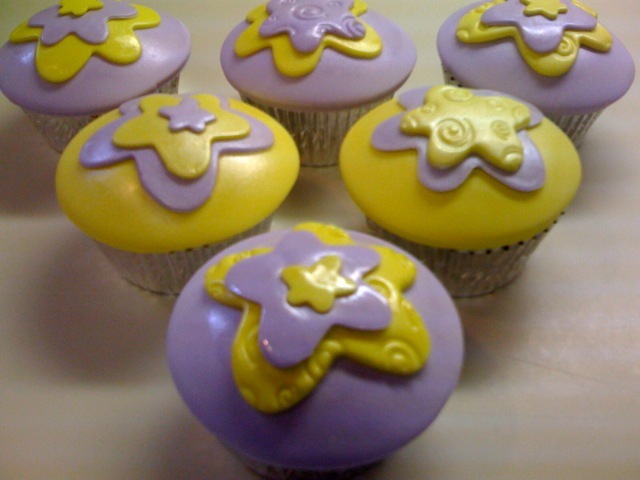 We've used cupcakes on two different occasions for our students at training session. Brooke was able to use our department logo and university logo on the cupcakes and our students just loved them. It made a boring training session delightful!!! 10/10 for innovation. but 0/10 for yummy looking. far too store bought for me. Wow! these look great to me. I can't wait for the next occasion to host a get together. The Cupcake Caps "inspired" by Thomas the Tank Engine that are pictured are actually the ones we used for my son's birthday party. He LOVED them -- he said they were his "very favorite part" of the party, which is high praise from a 3-year-old surrounded by presents. Everyone (even the grownups) was impressed by the look and taste, and I was thrilled not to have to worry about decorating 2 dozen cupcakes. (I still have blue frosting under my nails from the Cookie Monster cupcakes I attempted the year before.) Kudos -- I have a feeling these are going to be my go-to desserts for all future party-type functions. Cupcake caps get a 10/10 for me on taste and appearance. Do not be afraid. These seemingly plastic-appearing caps are just as yummy as the little cakes they cover. In fact, they perfectly complement such flavors as vanilla and spiced-flavored cupcakes, too. Brooke was able to customize both color and design for the cakes I ordered for a bridal shower. The turnaround on delivery of my order was quick, too. Also highly recommended for shipping something sweet to a loved one. Having experienced the cupcake caps first-hand I can honestly say they're wonderful! The Super Bowl designs for the previous match-up were great and the cheesecake/spice cake versions came in handy in a room full of hungry co-workers for our Thanksgiving Day spread. Anyway, it's about time the cupcake got a fashionable and tasty accessory! 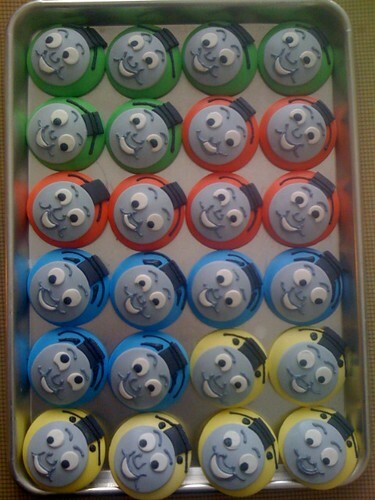 Thomas the tank cupcakes = super cute!